The team members I spoke with were very friendly and were able to answer my questions without hesitation. It would be impossible not to feel relaxed and comfortable staying in such a lovely place, the views and the accommodations were perfect. Everyone that we spoke with was incredible professional, friendly, and knowledgeable. Our stay was so incredibly relaxing! It was just what we needed to celebrate our 15th wedding anniversary. We can't wait to come back and bring our daughter with us! We all loved this cabin and plan to come back next year! GSCR has always treated us very well, and been very helpful. We are a constant customer :) Easy to use web site. Consistent high quality of the cabins. We've rented many times, and have always been greatly satisfied. We loved the view, the cabin, and will likely stay here again. After speaking to several members of your team while arranging our stay, it appears that everyone in your office is very nice and will go the extra mile to be sure your customers are happy. It was a lovely home and fit all of our needs. It was a perfect house for our family. We have never stayed anywhere that the company called us to see if we arrived. Thank you. The reason I chose GSCR is because of the friendly staff. I made several calls to different companies. One told me to just look on the website and I would find what I needed. When you are looking and are not that familiar with the area none of it makes sense. When I called your company the person I spoke with asked me what my needs were and for my email address and before I was finished telling her an entire list of rentals appeared that fit our criteria (price, size, location, etc.) and she talked me through my concerns. When I was initially booking my reservation for this location the staff was always friendly and patient with me. I was torn between several different locations. But, Kelly was nice enough with me to explain the difference in all and also suggest certain activities that I was looking for in staying at that location. Kudos to the staff!!! My family and I wanted a getaway that was quiet and private. This cabin offered us all that we were looking for. I can express just how wonderful this place was. Everything we needed to enjoy ourselves was at our fingertips. The cabin was fully stocked with everything the cabin itself was very cozy and inviting. I have already recommended this little piece of heaven to some of my other friends and I look forward to going back there soon. The pricing was reasonable and my husband and I had recently visited the area and thought that would be a nice place to vacation. They were helpful and great! They recommended Wildwater and we had a great experience because of their guides. Thank you! Our children loved the hot tub and the spiral staircase. As a guest, they keep you well informed of all the details leading up to your stay. They are helpful and willing to go out of their way to make your stay perfect! I got exactly what I needed, privacy! With a lot going on in my life, it gave me the opportunity to relax and enjoy some quiet time, which is exactly why I was there! Google search the first time. Repeat customer due to satisfaction, the 2nd visit, with many more to come. What can I say? We are spoiled for life. Beautiful view, beautiful decor, cozy cabin. The grandchildren loved the outdoors. We went on the train ride, horse back riding. We love to visit in the other seasons. We had a great time here! This was our first vacation as an engaged couple, so we wanted everything to be perfect and it was. The cabin has everything you need. The hot tub was in the perfect place and the view was awesome! We took a fishing trip and went to Cherokee. We had a great time just hanging out at the cabin and getting a break from our busy lives. We don't want to leave. Thank you. What can I say? We are spoiled for life. Beautiful view, beautiful dcor ,cozy cabin. The grandchildren loved the outdoors. Went on the train ride, horse back riding. We would love to visit in other seasons . The cabin was exactly as pictured on the website. It is always nervous booking something online. It was so nice to get away to someplace so beautiful and peaceful. My husband ahs always wanted to come to The Great Smoky Mountains. So this was a great way to make his dream come true. We booked this for our 15th wedding anniversary. Whenever the day would get stressful we would look at the cabin and count down the days for our vacation. When we arrived we were not disappointed at all. The bathroom is breathtaking, the bed was so comfortable. The hot tub was so relaxing we almost didn't leave the cabin on Saturday. We had a great time exploring the towns. Thank you for sharing your Native Winds Cabin with us. WE can't wait to visit again with out daughter. Loved the Scenery! Cabin is great and so was the hot tub. The kids loved it and so did we! So much we have considered moving. Friendly and helpful. We had a great trip, we really enjoyed our stay! Any questions I had were answered promptly. The staff seemed very knowledgable and friendly. The cabin was beautiful and the view was amazing!! 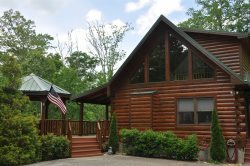 Even our 7 year old son was impressed and told us several times how much he loved the cabin. We liked the property best over others we found in the area. I spoke with the staff 2-3 times before arriving and a couple times when I arrived and they were very friendly and helpful I give them a big thumbs up.